Answer: Yes, for a truck shipment across the country, the timing worked perfectly. Thank you for your business. Parts we needed, speedy delivery! Thanks for the quick and accurate service! Answer: Thank you, we look forward to serving you in the future. Selection was good and customer service notices came quickly and regularly. One suggestion: It would be nice if you could actually track the progress of the shipment in more detail, rather than 'has been shipped'. Very satisfied withe product, service and selection. Answer: We know that is an issure and we're working on it. Soon you will be able to enter your order ID and email and see tracking links for multiple parcels and/or carriers in an order. Thank you for your input. Answer: Thank you for the 5-star rating. Live in Calgary, was excited to know these guys have distribution/shop in Lethbridge. Order to Door in 2 days really. 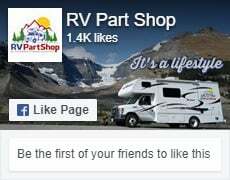 Will definitely search these guys first for Canadian RV parts store. Priced Pretty well. Answer: Thanks, we look forward to serving you in the future. Fast shipping. I would recommand you for sure ! Answer: Thanks, we do our best to get items out fast. I did not visit your shop my order was done by phone. If your shop is 1/4 as efficient as the level of customer service I received then it’s top notch. Answer: Thank you, David, we do our best to serve customers well. Glad you were happy with the service. RV PartShop is quick to respond and very courteous. We will definitely be ordering from them again. Answer: Thank you for your business and comments. just started applying yesterday, ordered on line 5 gal bucket came all banged up looked like it had been opened. When I opened sides of bucked had dried flakes stuck to side when I stirred it noticed flaked in coating as well. As to quality of product wont know until next spring see if it holds up. Answer: We are checking with the manufacturer to see if we can get some compensation for the poor quality. In the future, it's easier if it has not been used and we can replace it, but we will do what we can for you. fast delivery, good service. Would buy from these people again. Answer: Thank you for your comments, we look forward to serving you again. The item came to me as advertised and very quickly. Faster than I hoped and much faster than they told me. Answer: Glad we could exceed your expectations. Answer: Thank you, glad your experience was a positive one. Answer: You're welcome, our logistics team is the best. I have already shared the site information with other campers! Answer: Thank you, we appreciate the referrals. Excellent communication with customer right up and until delivery. Very knowledgeable and helpful. Prompt delivery via Purolator. Answer: Thanks you for your comments. Called the 800 number to check details of the above product. Fast courteous service, my questions answered and my order placed. My awning arrived two days later and was just as described. Great service and a great product. Thanks guys! Answer: You're very welcome, thank you for your business.